These yummy veggie burgers were created by a student in Sue’s vegetarian nutrition class. (Helen gets an A+ for this recipe.) They are super-healthy, high in protein and fiber. TVP stands for textured vegetable protein. Helen suggests using frozen TVP crumbles to make shaping the patties easier. We used Amy’s organic lentil soup in the recipe, but you can substitute tomato for a different flavor. 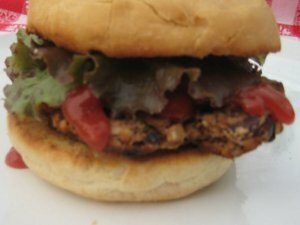 This recipe makes a lot of veggie burgers. After you have shaped all the burgers you need for your meal, you can put the rest into a meatloaf pan and bake it for 25 minutes. Freeze the loaf for another day, and then slice and serve the reheated loaf with pasta sauce and linguini on the side. Add a green salad and a glass of red wine, and voila! Easy weeknight meal. Sauté onion and mushrooms in oil until tender, about 4 to 5 minutes. Set aside. Chop nuts in a grinder or blender, and then place in a large mixing bowl. Add remaining ingredients and blend well. Shape into patties. Cook in an oiled pan on medium heat until browned. Turn gently. Or cook on the grill for a couple minutes per side. Serve on a bun with lettuce, a slice of tomato, and vegan mayo, ketchup, or brown mustard.